So having concluded that we cannot know for sure the origins of the Galloway or Narragansett Pacer, we return to Erica's story of her quest for the perfect horse, and her discovery of the Rocky Mountain Horse, and the possible origins of the Rocky Mountain Horse in the gaited breeds now long-lost in Britain. Because in return for her original question, I had one of my own, which was how on earth a British woman ended up finding Rocky Mountain Horses, let alone importing them to the UK. I grew up in Africa where I was mad for horses. My father died in my infancy (he always had horses) and I was forever moving about with my mother for her work. I begged my mother – ‘when can I have my own horse?’ and although she probably didn’t put it so harshly, the answer I recall was ‘never’. When I was eleven I lived for a year in Cape Town with my uncle, and my cousin had a beautiful thoroughbred called ‘Flyaway’; Sue (18) was under strict instructions never to put me on him, but I pestered her until she relented, whereupon he bucked me off so high I broke an arm and an ankle when I came down. I probably hit my head because I remember nothing. Anyway it didn’t teach me any sense. I came to England when I was nearly fifteen and after that years would go by in which I did not ride. I lived in cities and no-one I knew went riding. When I found a riding school, I hated the way you had to ride on the road or on muddy bridle paths that never went anywhere. I longed for the open spaces of my childhood and the feeling of being free and away from it all. I felt sorry for the riding ponies and the whole thing was quite depressing. I wanted to feel at one with my horse. In my mind I was ageless and my horse and I were cantering off into the landscape of my childhood dreams. And then, in the new millennium, aged nearly fifty, things transpired in my life to lead me to live on the southern edge of Dartmoor. Up behind me was 365 square miles of open moorland, one for each day of the year.... and then my children grew up and I saved a little money and then... I went back to Cape Town for the first time since I was twelve years old to visit that South African cousin who let me ride her horse. Our parents were long dead and the whole world changed about, our children grown and husbands gone too, but we both still loved horses and she still kept them. She told me all about how her ideas of keeping horses had changed. She taught me some of the things she had learned, about keeping them barefoot, about saddles and bridles, about nutrition. She rode bitless and she was into holistic horse management. I was fascinated. When I got home I started reading up about hoof-trimming methods. Sue did the Strasser method and many people here were prejudiced against it. I surfed the internet and read all about the hoof-trimming wars (I decided that all the barefoot methods were converging with time and the wars were stupid, but also that the barefoot advocates were right about the health needs of the horse’s hoof). In the course of this reading I was led, as will not surprise you, to learn about the American mustangs and how the research into the ‘natural hoof’ had led pioneers of the new methods to go study mustangs in the wild. This was spring last year and we are beginning to home in on how I made my choice of horse...! So. I found websites about Spanish mustangs. One of these sites in particular appealed to me. It had beautiful photos of mustangs running free in 2,000 acres in New Mexico. My African heart began singing at the sight. Idly, I sent an email saying – could I come on a working holiday on your ranch and learn about your horses? And they replied by return – ‘sure!’ and they didn’t want any money and offered to welcome me into their lives. I was overwhelmed. (I work hard in child protection for little money amongst deprived families; I wanted out from domestic and work responsibilities for two weeks and just watch horses in the sage brush.... and be hot.... ). They said they’d find me a horse to ride as well! I was trying to book my flight – which cost a whole lot more than I had budgeted – when I got another email saying they’d have to postpone because of family problems that had cropped up suddenly. Thank heavens I had not paid the flight yet. I was very disappointed. I kept on googling and because I had sites come up to do with ‘Rocky Mountains’ I hit on ‘Rocky Mountain Horse’, which as it turned out, had nothing to do with the big wild west, but was to do with gaited horses in Kentucky, a breed that developed in the Appalachians amongst hill farmers. These horses had all the attributes that I favoured – hardiness, strong legs and feet, intelligence and survival of the fittest, versatility; and they were ‘smooth to ride’ (what was that?) and they were sweet and loved people! They were the horse of choice for ‘baby boomers’ who had sore knees (I was now fifty-six and my knees got sore when I rode; I’d been riding locally with a friend). To cut a long story short, I decided this was it, this was the perfect horse for me. I wanted one. I reckon that you should choose a horse to fit the place you want to keep it, and the way you want to keep it – for me that meant living out on Dartmoor, which has a harsh climate in the winter. When they garden, people make the mistake of choosing exotic plants and then planting them in the wrong place and watch them fail instead of thrive. I reckoned, I’ll choose a horse that will thrive being out, being barefoot, that’ll be safe to trail ride, and that’ll be responsive to the love I want to give. Moreover, it turned out that Rockies were not, after all, an ‘exotic’ horse. They carried the genes of old British breeds, now extinct, that were ambling ponies and horses that were exported to the colonies back in the days of empire. I found out that hundreds of years ago, English horses were ‘gaited’ (amblers), but now that folk memory has been lost. People here don’t value that history and have never heard of gaited horses. They think I’m crazy to want one. But to me it made perfect sense – this is the ‘natural horse’ that the ‘natural horsemanship’ people should want – a horse that is bred for comfort and safety to ride, that has a good ‘work ethic’, and has been selected for hardiness. 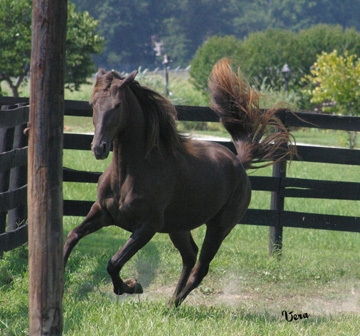 A horse that doesn’t go lame, that breeds into its thirties, that is an easy keeper, that is loyal, that loves to go, that doesn’t need the vet. A horse that hasn’t been bred for competition without regard for temperament and soundness, but which the mountain families cherished for its ability to work with people in a harsh environment, surviving hardship and poverty and giving of its best. So, I started figuring out how much it would cost me to get one if I used the holiday money and the money I’d saved for a new car. It was a bit more expensive than that to buy one from the very few European breeders. It shocked me how much: Rockies are a ‘rare breed’ and although not endangered any more, there are only a few thousand of them in the world. Then I looked at importing one myself. I read all the bloodlines and did months of research, trawling the internet. I saw one on a website at a ranch in Kentucky. I asked the breeders to send me a video. She was a queen! She was better than all the others – she moved like a dancer. I was enraptured. I realised if I ran the risk of the import myself, I’d get a better horse than buying in Europe. Also, I could have her bred into the bargain to a first-rate stallion and import another one in her tummy – two for one! Then I could sell the foal and get part of my money back. So I went for it. When she arrived, my friend led her out of the stable where the transport had dropped her off in Devon – I was too overwhelmed to do anything but watch, and I’d never loaded a horse into a trailer – I’d never done anything with a horse except ride it (I had a lot to learn!). Angel walked out into my world and into my heart – she was even lovelier than I’d imagined (see photo below). I felt I was going to cry – I was speechless. My dream come true. And guess what – now I want another one! Another mare to be her friend and life companion and to bring another foal of this wonderful breed into Britain. I’ve gone horse mad, mad. Many thanks to Erica for her correspondence and contributions! I will return to this question again, some day, should I discover any new information. Hi Jill - sure! I'll send Erica and email with your contact info so she can get in touch with you. Just come across this posting, trying to find uk owners of rocky mountain horses (i own one myself) Would love to get in touch with Erica - can you help? Hi Connie - I forwarded your comment and email address to Erica, so she can reply to you if she wishes. I have come across this posting only recently and wonder if there is any way to contact the English with the Rocky Mountain mare?